20 tools including Charting, Backtesting, Optimizing, Composites... and much more. Quantshare is a desktop application that allows trader to monitor and analyze the market. QuantShare is suitable for all levels of traders and it works with U.S. and International markets. 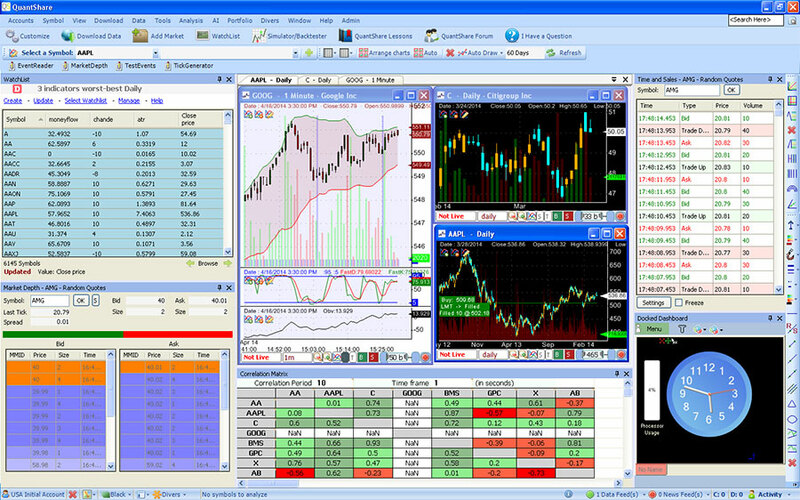 It is not only a stock trading software. It can be used by Forex, Futures, Options and ETFs traders. With QuantShare trading software you have access to trading items shared by our members. This includes data downloaders, watchlists, trading systems, custom drawing tools... (+600 items). You have access to professional tools that will help you become a successful trader. QuantShare has tons of features. Click here display them. - Dynamic watch-lists are automatically updated if necessary on new quotes or new databases data. Average RSI value of a basket of symbols. - Optimize trading systems to find which set of parameters leads to the most profitable trading system. - Optimize prediction models to find which model has the better prediction accuracy. Use .Net scripts to automate everything and implement more advanced tools. Increase your trading knowledge with the help of our community of traders, become an expert. The sharing server is the place where our users share what they have created using QuantShare.